As my friends and more than a few acquaintances know I am not a big fan of soccer. But you didn’t have to be a fan of the Beautiful Game to be immensely sad, even if only momentarily, for the loss of football player Emiliano Sala, the lanky free-scoring Argentine striker killed in a single-engine plane crash as he was piloted over the English channel to join his new team, Cardiff, in the English Premier League. A dream come true turns into his friends, teammates, and a family’s permanent worst nightmare. With technology being what it is nowadays Emiliano had the opportunity to record some thoughts when the plane developed engine trouble. He is noted as calling a family member and saying, “I am so scared.” And that is perfectly, 100% understandable. But if I had one wish for Emiliano Sala before his plane ended up in the English Channel it is that he was able to conquer that fear and have some pleasant thoughts enter his mind at the end. Maybe it’s a fantasy but it’s a fantasy I’ll hold onto. Rest in Peace, Emiliano Sala and the pilot, age 59 Mr Ibbotson. Another footballer had the good luck to fall in love, get married, and honeymoon in Thailand. His name is Hakeem Al Araibi and he is currently under arrest and being detained in Thailand awaiting an extradition request from Bahrain for him to serve a 10-year sentence related to the Arab Spring uprising of 2011. Hakeem denies the charges. There is ample evidence that supports that. There has been much international criticism regarding the handling of the case so far but it is fairly early. Thailand has the discretion to release Hakeem to Australia where he has refugee status and is a model citizen. Let’s hope in this tale of two footballers Hakeem’s story has a much better ending. There is no logical reason why good luck has to lead to bad. Justice delayed is justice denied. 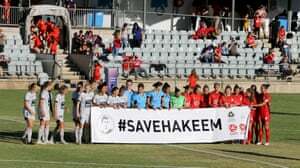 Save Hakeem indeed. It’s the right thing to do. And who knows? Maybe Hakeem’s bad luck, so far, has saved him from worse luck. It’s possible. Cormac knows what he’s talking about. May Hakeem be back home with his wife in Australia soon. Let’s hope in this tale of two footballers Hakeem’s story has a much better ending.